A delegation of Chabad-Lubavitch emissaries shared the spirit of Hanukkah this week in a meeting with Prime Minister Binyamin Netanyahu. 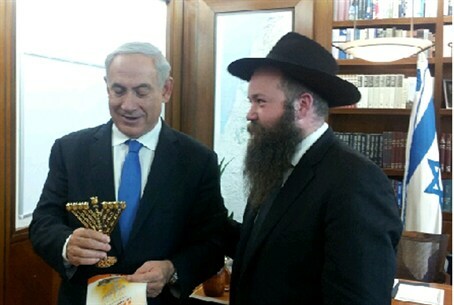 A delegation of Chabad-Lubavitch emissaries led by Rabbi Yosef Yitzchak Aharonov, chairman of the Chassidic movement in Israel, shared the spirit of Hanukkah this week in a meeting with Prime Minister Binyamin Netanyahu and other government officials. The delegation, which included Rabbi Shai Chervinsky and Rabbi Moshe Carmel, presented the prime minister with a scale model of the menorah that was lit at the time of the Holy Temple. The little menorah is designed in accordance with the parameters explained by the late Lubavitcher Rebbe, Rabbi Menachem M. Schneerson. The prime minister was also presented with a small booklet on the eternal meaning of Hanukkah, published by Chabad-Lubavitch. During the meeting, the emissaries described their activities with families of terror victims around the country. They also presented the prime minister with a copy of a letter sent by the Lubavitcher Rebbe to Netanyahu during Hanukkah in which he listed activities for the entire Land of Israel.